Day Cleaning vs Night Cleaning: Which Is Right For You? Day Cleaning vs Night Cleaning: Which Is Right For You? Day Cleaning vs Night Cleaning: Which Is Right For You? Hiring a commercial cleaning company is a smart choice for busy property managers. Not only will you save your company time and money, but you will also ensure the health and cleanliness of the office environment for customers and employees alike. A reputable commercial cleaning company should discuss the benefits of each during the walk-through stage to see if it might be a good fit for your building. Since day cleaning is done during the early morning and daytime hours, it may mean some of the cleaning will be done during business. There is a growing consensus that says day cleaning can save money because it lowers the energy consumption of your office and can increase the security of your building during the nighttime hours. So the choice of whether to have day or night office cleaning should be determined by the company’s needs. As we said before, the biggest benefits for bringing cleaning crews in your office during the day are that you’ll see lower energy consumption and tighter security at night. Although most day cleaning starts in the early morning hours before your staff arrives at work, the office lights will not need to be burning all night long for cleaning crews. The building will be empty and secured throughout the night. Additionally, you can lower your heating and cooling costs, if your thermostat can be turned down or up (depending on the season) overnight. There is also the advantage of a cleaning professional being on site should an incident occur that results in a big mess. It can be professionally cleaned immediately rather than letting it sit for hours until the night crew arrives. This could mean the difference between salvaging an expensive carpet or scrapping it because a stain is already set in. That said, there are some concerns that accompany day cleaning as well. If the floors in certain areas need to be mopped, it can create a slipping hazard within your building for your customers and your employees. Cords of the machines can also be a tripping hazard. The noise-related to vacuuming can be disruptive, although most vacuuming is done in the early morning hours before daytime staff arrives. While having your office cleaned at night may increase the amount of time lights are turned on in your building and increase the need for heating and cooling, these costs may be offset by the efficiency you will see out of cleaning crews during the nighttime hours. Without employees to work around, cleaning professionals can clean your office in the most efficient way possible. They will not have to work around business being conducted and they will not be distracted by employees who will want to pull them from what they are doing currently to clean something else. The health and safety of your employees and customers are also greatly increased with nighttime cleaning since they won’t be subjected to slipping or tripping hazards while the floors are wet. We have found that cleaning is least disruptive by having your cleaning company come during the early morning hours to get the bulk of their “noisy” cleaning done first. Depending on the size of your office, your cleaning company may employ either full-time or part-time staff. If they start cleaning at 5 am, they may be done by 9 am for a 4-hour shift, or by 1 pm for an 8-hour shift. Either way, they don’t need to be working throughout the entire business day. The other end of the day works as well. You could have your commercial cleaning team arrive a couple of hours before close so that they are only there for a few hours after close, and possibly still during the daylight hours. Both of these options would increase overnight security and still decrease the amount of energy consumption used for cleaning hours in your office. You may also consider hiring a day porter for your office. 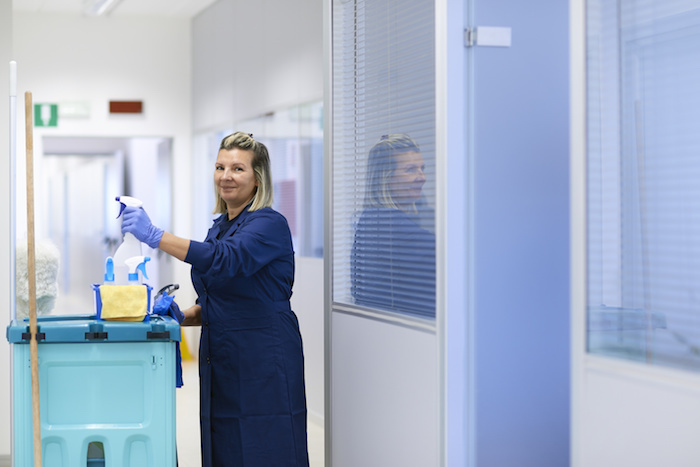 This would lower the amount of time the cleaning teams will need to be in your office during nighttime hours to do the full cleaning, as the office would stay much cleaner during the day with someone on hand to handle messes as they occur and to keep the bathrooms, break rooms, or common areas tidy. All Building Cleaning Corp offers both daytime and nighttime cleaning services as well as day porters to help you find a compromise regarding the time frame to have your office cleaned. Southeast Florida has trusted All Building Cleaning Corp for over two decades for their commercial cleaning. With a bilingual staff and an excellent customer service team, you can rest assured that we will be the last commercial cleaning company you will ever need. Call our top-rated customer service team today for your complimentary quote!